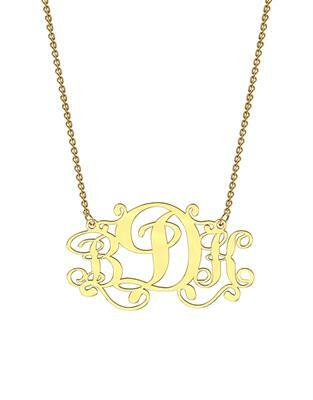 From the fabulous personalisable collection from me.mi is this beautiful scroll monogram necklace. Made from solid 9ct Gold, choose your three initials which are elaborately designed into a beautiful pendant completely personal to you. You could choose your own initials, your children, partner or family members. This is a fabulous wedding day gift to celebrate her new surname, or a great gift for the arrival of a new family member! The height of the design is approximately 20mm and sits on a 45cm chain. Delivery is approximately 20 working days so we suggest you order in plenty of time for your special occasion. As these are made to order this necklace is non-refundable or exchangeable. Write the three initials as you would like them to appear at the checkout and double check your selection before completing your order.